Draw cards equal to the number of cards in target opponent's hand. Tezzeret's Gambit . 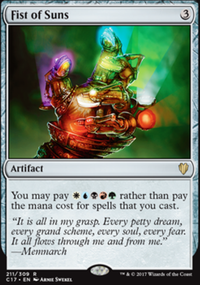 Can become a free spell, draws cards, AND you can use proliferate on your experience counters. Fantastic. Thousand-Year Storm . Expensive, but great if you resolve it. Treasure Cruise . Very easily a 1-mana draw 3. Volcanic Vision . This just looks like good value. Precognition Field . 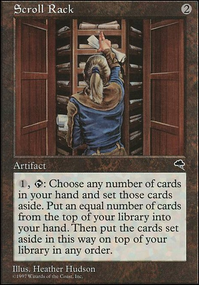 Playing the top of yoyr library is like always having an extra card in your hand. The exile allows you to ensure you don't draw any dud cards if you have the spare mana. There's a bunch other good cards there too. Most of the lands I see are good. Spell recusion creatures are always good: Archaeomancer , Izzet Chronarch , Anarchist , Mnemonic Wall , Salvager of Secrets . Maybe just 2 or 3. Some thoughts, hope it helps! You are missing important card draw. You should consider Impulse, Frantic Search and Recurring Insight. Also Treasure Cruise and Dig Through Time work well. I agree with leven110 here, your deck needs a lot of mana. 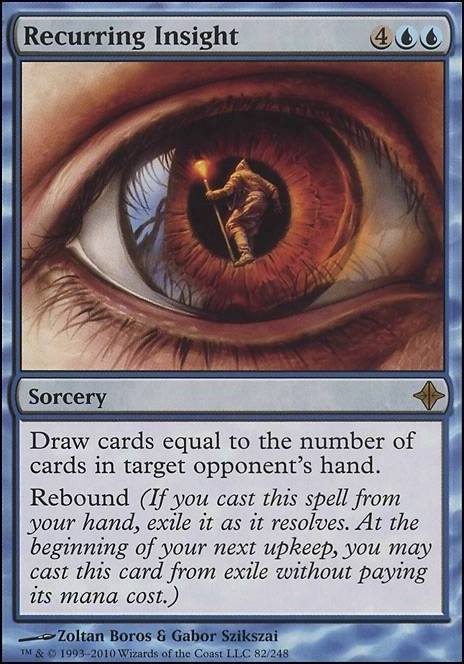 All of your big card draw uses X in their mana cost, so they'll be stuck in your hand for many many turns. Maybe add something a bit cheaper such as Recurring Insight? For consistency, Brainstorm, Ponder, and Preordain are all pretty amazing imho. 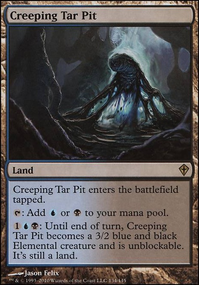 For a deck with that many spells with big costs, 35 lands is also pretty low, and you could probably comfortably go up to 38 to get your land drops more consistently. I would also personally definitely put in Rhystic Study if I could. Maybe also cut some countermagic? 14 is a lot, and considering you're very low on boardwipes (the only one I'm seeing is Cyclonic Rift), maybe switch a few counterspells for a red boardwipe? 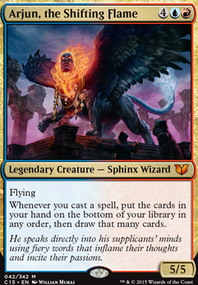 As for the mana problem, Braid of Fire is pretty amazing with the X spells, and if you get it out early it'll help you out tons casting those big spells early. CrimsonKing: Fair enough. Recurring Insight has always proven itself in my meta, but I’ve been considering cutting Murder of Crows for a while. Might go in that slot, or perhaps Hurkyl's Recall? Probably cut Recurring Insight. 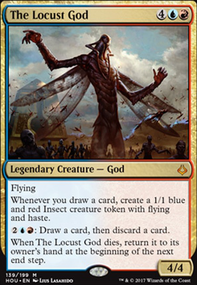 Trust me whir has won me so many games for just 4 or 5 mana. 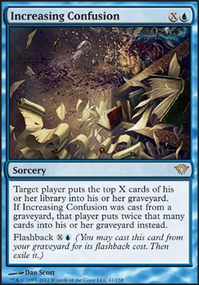 Getting your Isochron Scepter or Skullclamp out before your untap is extremely powerful.